Pricetack enables online sellers to offer items with scheduled price reductions. Sellers specify an initial price which is scheduled to decrease over time until the item is sold. Buyers can purchase immediately or wait for a discount. However waiting risks losing the item to another buyer. 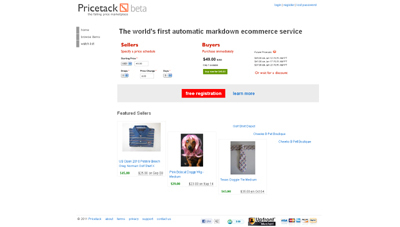 Pricetack is the web’s only “automatic markdown” service. This format enables price discovery like auctions but without the downside of low reserves or requiring buyers to wait for completion. This format organizes best offer negotiation without requiring buyer/seller interaction. This format lends itself well to customer engagement since prices are constantly changing.